The perfect summer meal starts with the perfect summer appetizer. This week, we are offering fresh mussels in a lemon basil and white wine broth. This light and slightly fluffy textured mollusk is a quintessential opener for any meal that won't and leave you feeling weighed down. 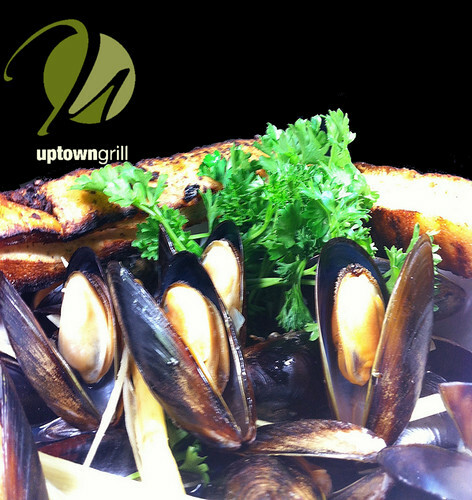 Our freshly steamed mussels are tossed with fresh basil, lemon, and white wine for the authentic Italian feel without that expensive Italian restaurant price! Followed with a glass of white wine from our extensive wine menu and a cool night on the patio... you couldn't ask for a more perfect dining experience! 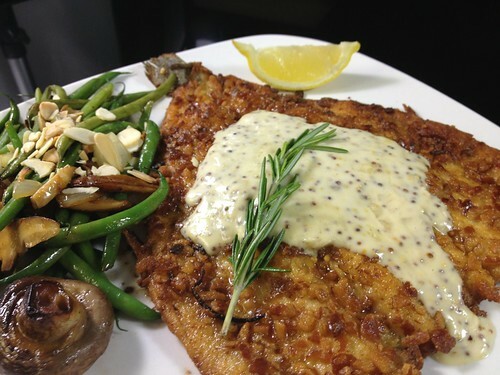 In keeping with the healthier and lighter dining experience, we are also featuring pretzel crusted rainbow trout. Here at Uptown, we are lightly pan frying the trout in a pretzel crust which is a new spin on the traditional bread crumb crust used at many other places. The fish is then topped with a stone ground mustard butter with a side of sauteed Swiss chard and roasted rosemary new potatoes. The fish itself is native to the tributaries that feed into the Pacific Ocean from North America and Asia. Most closely related to the salmon, this trout is a popular target for sport fisherman. Being very popular in Western cuisine, rainbow trout is typically farm raised or caught wild within the streams of the U.S. This trout has a tender and mild flesh with almost nutty flavor and is sought after for its omega-3 fatty acids which help prevent heart attack, stroke and heart disease. Not only is this dish good for your health, but it also tastes great too! This light and fresh dish is a great take on a perfect summer entree that will definitely leave you fulfilled. Both dishes sound delicious, but I'm not a lover of mussels. Will try the rainbow trout. Not only does it sound great, but we "old people" need dishes that are good for our health! !